English League Division One match at Highbury. Arsenal 3 v Chelsea 0. 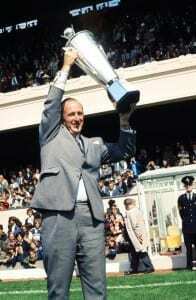 Arsenal manager Bertie Mee holds aloft the Manager of the Year Award before kick off. Bertram Mee enjoyed an unremarkable playing career, cut short by injury; an outside right for Derby and Mansfield, he climbed the managerial ranks at Arsenal and led them to double-winning glory. Mee had joined the North London club as a trainer in 1960, having been in the Royal Army Medical Corps during World War Two. He became respected as the club's physiotherapist but was a shock appointment as manager when succeeding former England captain Billy Wright in 1966. He was to hold the job for a decade; returning the club to winning ways and, in 1971, matching the earlier feat of their North London rivals Tottenham by claiming a league and cup double. Mee's strengths were said to lie in his man management, motivational skills, and with his expertise in fitness. But he also made good appointments, both in his staff and his players. Coaches Don Howe and, in Mee's first season, Dave Sexton both played important roles. Howe in particular was said to balance out Mee's lack of tactical expertise; as a partnership though the two were hugely effective. On the field, Mee's early signings included George Graham and Colin Addison. He brought the young Charlie George into the first team and slowly got the best from Frank McLintock, moving him to the centre of defence and appointing him captain. The Fairs Cup in 1970 was the Highbury club's first silverware since 1953. The following season Mee's men beat Don Revie's highly-rated Leeds to the Division One title (securing the championship with a win at White Hart Lane) and defeated Bill Shankly's Liverpool in a dramatic FA Cup final shortly afterwards. Don Howe departed to manage West Brom the following season, but Mee's Arsenal continued to be competitive in both competitions, losing the Cup final to Leeds the following year, and finishing league runners-up in 1973. The stars of the Double team though began to depart Highbury, and Mee was unable to bring together another title-challenging side. He left in 1976, having transformed the club. It was to be his only senior management role.